Between analog and digital devices are the electronic headlight testers. The optical valuation via the test screen as well as with the photodiode enable a correct evaluation. The electronic headlight tester with new photodiode technology allows for testing of all headlight systems. LCD display and operation panel guide the user through the procedure. Electronic headlight testers are suited for testing and and justing of all light sources and usable for all types of headlights. Beissbarth is with the MLD 110 the TÜV-certified supplier of headlight testers for Mercedes-Benz workshops. The homologated headlight testing system MLD 110 was specifically designed for the requirements of Mercedes-Benz workshops. The developed solution is able to test all types of headlights and light sources. The attachable LED1 color filter for the light box enables the perfect testing of LED headlights by separating the disturbing blue verge in the area of the cut-off line. 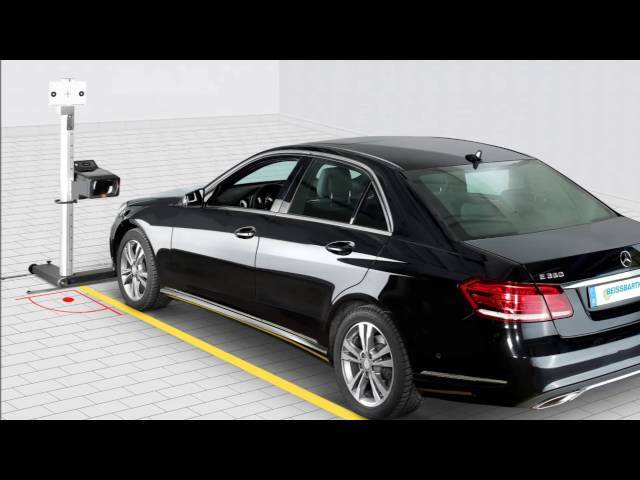 The 7-meter roll-on markers (for trucks: 9 m) and the leveled rail system for the headlight tester complement the system, defined by Mercedes-Benz.